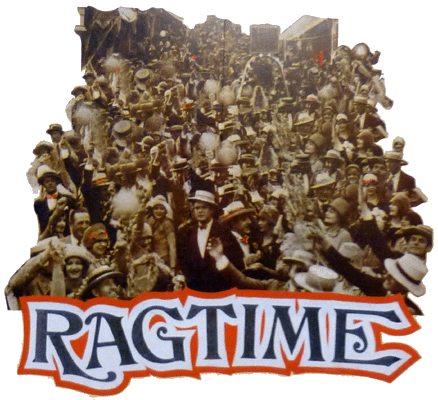 RAGTIME is the quintessential American musical that won several Tony Awards in 1998. It paints a powerful portrait of life at the turn of the century. Three stories are woven together that poignantly illustrate the struggle Americans faced dealing with class, race, money and justice in a country still struggling to find balance as they moved from the 19th to the 20th century. It was a tumultuous time when immigrants were looking to find hope in America, when former slaves and their children, now freed, were trying to establish their hold on the American dream, and the white upper middle class society struggled to maintain their lifestyle and expectations. Intertwined with the fictional characters are historical figures including Harry Houdini, Evelyn Nesbit, Harry K. Thaw, Stanford White, Emma Goldman, Henry Ford, Booker T. Washington, and J.P. Morgan. Mother, Father, and Little Boy enjoy their life in New Rochelle. Mother told herself how fortunate she was to be so protected and provided for by her husband. Mother wishes Father a safe journey as he prepares to leave for the North Pole. Grandfather was thoroughly irritated by everything! counseled friendship between the races and spoke of the promise of the future. enough is enough. I'm putting Sarah into Coalhouse's life. And he did! Our son will travel with head held high, just as far as his heart can go! In Harlem, men and women listened to the music of Coalhouse Walker, Jr. This was a music that was theirs and no one else’s! Evelyn Nesbit was the most beautiful woman in America. When she wore her hair in curls, every woman wore her hair in curls. The citizens of New Rochelle lead privileged lives. Tateh and his Little Girl (Bradley Miller, Karen E. Kolkey) arrive in New York along with immigrants from all over the world. In Harlem, Coalhouse Walker (Deus Xavier Scott) creates the music known as Ragtime. Emma Goldman (Joanna Churgin) speaks at Union Square. Harry Houdini (Drew Fitzsimmons) wows audiences. Evelyn Nesbit (Amanda Majkrzak) delights in telling her “Crime of the Century” tale.